Body Mass Index (BMI) is one method used to guess total body fat a person has. There are many methods of calculating body weight. The most accepted one is measuring one’s body mass index. It is an important screening tool that tells whether you are obese, overweight, underweight, or healthy. The Body Mass Index is a method that uses the height and weight to measure the amount of fat that is normal for a person to perform his daily activities. 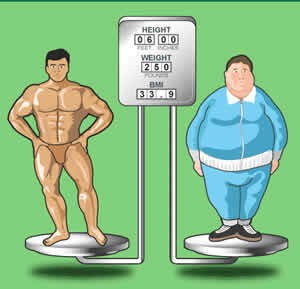 It is calculated by dividing a person's weight in kilograms by the square of the person's height in meters. [BMI= Weight (kg)/ Height2 (m2)]. There are two formulas or ways where you can use to calculate your body mass index manually: The metric version and the imperial (English) version. They will anyhow give you the similar results, but the methods are different.